Using this DALI driver you are enabling a future-proof led technology. Manufacturers have flexibility and control to produce the best quality of lights. 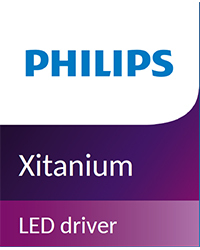 The Xitanium LED driver features SELV, very low ripple current and temperature control. The high reliability is supported by 5 year warranty. The output current is adjustable using the Philips MultiOne configurator or SimpleSet. The power ratings vary from 10W to 75W. 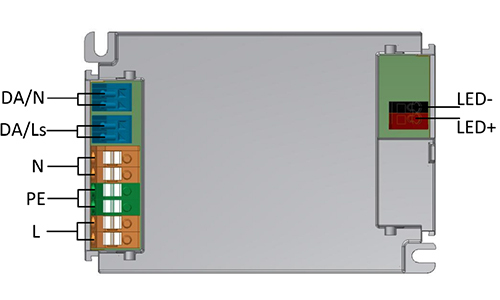 The same printed circuit board (PCB) with identical power terminals can be configured in dfferent layout (square or rectangular). The slim linear version is suitable for installation insider light fittings. The driver in the present listing is ideal for LED panels, downlights and spots. The spacious input and output terminals allow easy installation of 4 core and 5 core cables.